Gen Xtinct: "On Golden Pond"
This news story about one of the wood-hull boats used in the 1982 classic “On Golden Pond” got me thinking about the movie, and just how nearly perfect it was. 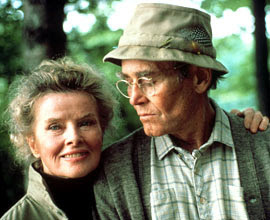 The performances by Henry Fonda and Katharine Hepburn were as good as it gets (both were rewarded with best-actor Oscars), and the story, filmmaking and music (by Dave Grusin) were tremendous. Why, it even made a pretty major impact on this 14-year-old boy, more used to shoot-'em-up movies about star wars and supermen than talky flicks about relationships. Plus, it introduced those two iconic actors to a new generation of fans. I got a TON of mileage out of my ham-handed Katharine Hepburn impression (“Norman, you old poop!”), starting in grade school and lasting well into the ‘90s, after Martin Short did his own awesome impression on SCTV and SNL. Is this on your top-movies list? This one of my all-time favorites! I had the soundtrack for a while on cassette, but it's disappeared. And it doesn't seem to have been released on CD at all. I remember that impression of yours...quite good!